Satisfy your hunger with our specially-made chicken bone soup! Our authentic Paitan soup is a potently flavourful collagen-rich broth made by simmeringtop quality pork bones for over 10 hours and then adding the goodnessof succulent fresh vegetables. A match made in heaven! We usecopious amounts of top quality aged soysauce which is simply bursting with natural flavour, then add chicken soup which has been infused with the goodness of the fish and shelifish.It's a flavour staole that is know andloved throught Japan. Guaranteed to please! 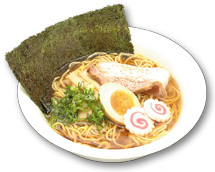 Several types of top quality aged unprocessed miso and spices are ground together and added to a home-style soy-based soup which has been infused with the goodness of fish and shellfish. The addition of rich tonkotsu soup perfects this scrumptious collaboration of flavours. This delicious,light and healthy soup is a flavour collaboration created by combining top-quality rock salt, which is rich inminerals,with chicken soup that has been infused with the goodness of fish and shellfish. This simple yet scrumptious soup is created by combining slow-simmered vegetables with top quality soy sauce.